This article will review the basic information and access permissions available within the employee directory. Once an employee is onboarded onto Collage, they are automatically listed in your employee directory. The directory is a central resource for the whole organization to access information about all active employees on your team. By default, your employee directory will appear in a list form, with employees listed alphabetically by their first name. Employees' names, titles, departments, locations, and statuses are visible to the entire team at-a-glance. Note: You can also review what information employees see on the platform by default. 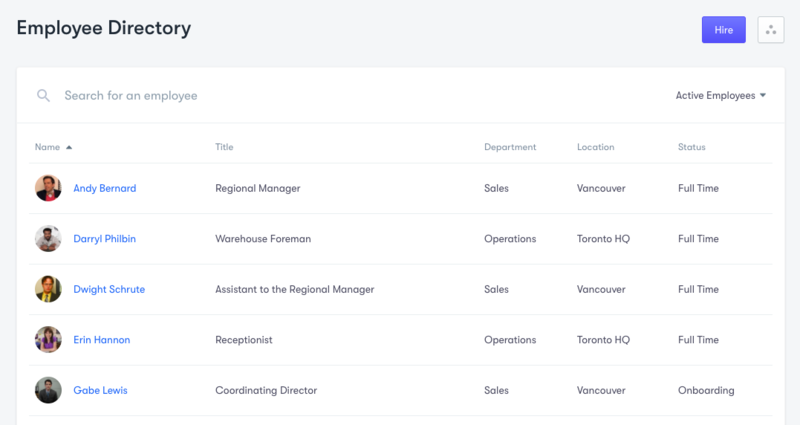 If you have your org chart enabled (under Company Settings > Roles & Permissions > Features), you will see a button with three dots next to the Hire button on the right-hand side of your Employees module to access it. The organizational structure is determined by the manager-employee relationships as set in the Job section of each employee profile. Note: You can currently only view the org chart by using the Google Chrome browser.